Workplace accidents – when is the worker to blame? Home > Blog > Questions & Answers > Workplace Accidents and the Blame Game – Whose Fault is It? Today’s guest post comes from Alex Moore. We hope you enjoy his research and thoughts on when workplace accidents are the fault of the employee and when they’re the fault of the employer. Thanks, Alex! Back in the day, more often than not employees were exploited by the people they worked for. This happened because of way too lenient laws and regulations, which have since evolved and changed for the better. Still, a lot of workers get injured each year, and people working in construction have it the worst by far. But who is to blame when injuries happen? According to the Occupation Safety and Health Act of 1970, it is the responsibility of all employers to maintain a safe environment free of any field-specific hazards for their workers. Whenever they fail to do so, they become liable for citations and penalties which can turn into full-blown lawsuits. A whopping 21.4% of all workplace fatalities are in the field of construction, making it the most unsafe industry today. Injuries in this line of work can happen by falling, dropping or any other form of impact, as well as by means of electricity. This, along with chemical, fire and machinery-related hazards are the main issue in similar lines of work, such as landscaping and others. While it is true that people working outdoors have higher risks of injury or distress, a seemingly guarded work environment such as a corporate office also has its own perils. Anything from a fellow colleague to faulty electronics or furniture has the potential to hurt employees, which is why this type of job shouldn’t be overlooked when discussing safety standards. While it is the employer’s duty to ensure that the work environment in their company is a safe one, not every single accident is their fault. For example, if an employee’s substance abuse is an underlying cause of the mishap, the ensuing events are no longer to be blamed on the firm. Unless toxicology reports show otherwise, the person in question has breached previously agreed upon terms of employment and will be sanctioned accordingly. All standard contracts clearly stipulate that workers are forbidden to engage in drinking or recreational drug taking before or while on the job. Thus, an incident triggered by this such as one involving a drunk construction worker operating heavy machinery while under the influence is not lawsuit material. In the same way, someone showing up following judgment-impairing recreational activities at the office is held accountable fully for any injury that might ensue. However, because this happened on company grounds, the firm is still required to provide the injured party with adequate treatment paid in full out of compensation funds. These are covered by something that the company needs to purchase specifically for situations like these. Not only do they cover medical attention, but also lost wages and other financial damages that the injured person might have sustained following the accident. Furthermore, most cases result in workers receiving the compensations regardless of whose fault it was in the end. Although received compensation is a prerequisite in most cases, there is a chance that further legal action can be pursued. For example, if your employer’s own intentionally egregious conduct was what led to your accident, you can easily file a personal injury lawsuit against them. As a worker in any field, it’s important to know your rights and take adequate action against those who violate them. In case the company you work for has failed to purchase insurance compensation for situations like this, you can still collect your money by suing them in civil court. Furthermore, if the mishap was triggered by either a toxic substance or faulty equipment, you are entitled to sue the manufacturer of said product directly for supplying your company with life-threatening goods. While putting forward such a complex legal filing against a person or a company seems like too much of a hassle, if you don’t do so, no further punitive measures will be applied to your employer. Therefore, the importance of signaling wrongdoings in various professions is high. And, on top of that, most cases of this nature are settled out of court with the plaintiff receiving millions of dollars worth of damages, which means that your mishap is probably worth as much too. It won’t mean you’re materialistic, it just implies being given what you’re owed. 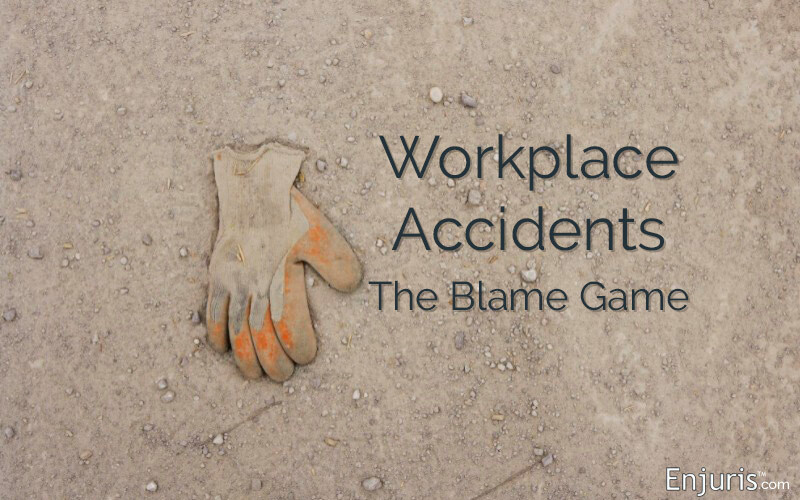 In the case of most workplace accidents, the blame game is a complicated one to play. Workers blame it on their higher-ups, while companies would do anything to make it seem like it was their laborers’ fault. Well, to sum it all up, both employers and employees need to know their rights like the back of their hand so that the correct actions are pursued. Most of the time, firms are the ones to be blamed for any related injuries or accidents. However, if the affected party happened to be under the influence of alcohol or drugs at the time of the event, the blame is lifted off the shoulders of the company. Still, insurance compensations are paid by the company so that the person can get adequate medical treatment. While this is a prerequisite in most situations, it’s important to note that sometimes it’s not enough. While companies are indeed legally bound to issue these compensations if further legal action is not pursued their obligations stop there. Thus, if you feel like you’ve been wronged and you have the evidence to back that up, then filing a lawsuit is recommended.